Bass strings on a short-scale are under less tension that on a long scale so if you’re used to using say 40-95 on a long scale, you may need to go up a gauge to 45-100 to get the tension back to where you like it. Some manufacturers seem to simply make their strings shorter or longer depending upon the scale whereas others use a thicker core for their short scale strings. 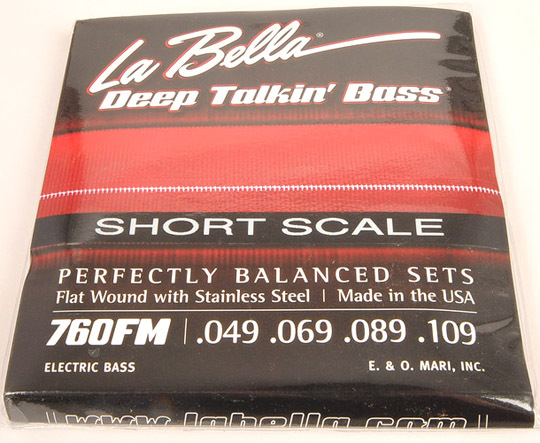 A quick but important note – some manufacturers produce short-scale bass strings that only work on 30″ scale basses. If you have a 30.75″ scale bass, or a bass like the Hofner Violin where the tail-piece is some distance from the bridge saddles, you’ll need to use MEDIUM SCALE strings otherwise the wound part of the string won’t reach past the nut. Here in the UK the most commonly available sets os short scale strings are Rotosound’s RS66s 40-90 stainless steel roundwound & RS77s monel flatwound 40-90. Both these sets have the afore mentioned thicker inner core. Sorry Rotosound but in my opinion these strings are AWFUL!!!! Whilst I quite love Rotosound’s long scale strings, their short scale offerings suffer with terrible overtones, particularly the low E. It’s so bad that if you fret an A at the 5th fret on the E string, it simply sounds out of tune. They also tend to rise in pitch considerably just after being plucked/slapped, which adds to this out of tune vibe. It’s a real shame because they feel great and playing fast on them is a breeze. If you like Rotosound strings then my advice would be to try using long scale Rotosounds a gauge higher than you’d use on long scale and cutting them down about an inch from where the silk wrapping starts. On most shorties you’ll have to carefully wrap a little of the wound part of the string round the tuning post. Take your time doing it – there is a risk you could damage the string although I’ve done this countless times with no problem whatsoever. This doesn’t work on Danelectro basses sadly due to their tiny little guitar-style tuners. I’ve just fitted a set of their PSD BASS 99 (Piano String Design) to one of my SWB-1’s and they sound awesome! I’m just about to contact Rotosound in the hope they might consider making a dedicated short-scale set of these. D’Addario’s round-wounds are the most consistent and pro-sounding short scale roundwounds on the planet imho! They do both a stainless & nickel range. They sound very pure in tone and have good tension. All that overtone/out-of-tune stuff you get with the Rotosounds is non-existent with D’Addarios. When I got my first short scale, a Danelectro Longhorn, the only short scale strings available locally were Rotosound. I soooo wanted the bass to work for me, and whilst I loved the feel of the bass, and the Rotosound strings, the ‘out-of-tune’/overtone thing was driving me nuts and I was very close to selling the bass on ebay!! I ordered a set of D’Addario Pro Steels online just to see if they made any difference before I sold the bass and well – the difference was night & day!!! When I first plugged the Dano in after fitting the ProSteels I could not believe what I was hearing. Pure, solid lows with beautiful bell-like highs!!! You get a long-scale type tone from a short scale bass with these. My only gripe with D’Addario is they do their ‘super-light’ gauge in Nickel?! D’Addario’s flatwound strings are equally fabulous, although for some they sound a little bright and they are slightly higher in tension. For a darker more vintage-sounding flatwound you might be better served with LaBella, Thomastik or Pyramid. The first thing I’d say about GHS is what a fantastic company they are to deal with. They’re extremely enthusiastic and passionate about what they do, and they seem to genuinely care about their customers and were so helpful answering any all my questions. These qualities can be rare today so hats off to GHS! I currently have four sets of GHS bass strings sent by the company for me to review. Yesterday I video-reviewed their round-wound Super Steels. I have yet to check out the other three sets, but these Super-Steels have very quickly become my favourite round wound strings!! 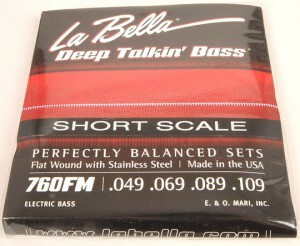 I’ve also tried their piccolo bass strings on my short scales which are fabulous. The Piccolo strings they make are long scale but cut down just fine for short. I’ve only personally tried Thomastik JF324 Jazz-flats. They are by far my favourite flatwound short scale strings!!! Really low tension and flexible, but with this super-warm, middly, punchy tone. I used these on a tour I did with Steve Cropper and they sounded just ‘right’. I really can’t recommend these strings enough however if you use a lot of force in your playing and don’t want to adjust, you might be better with LaBella or D’Addario. I’ve tried Fender’s acoustic and electric short scale bass strings and like them both. The sets i tried were pretty low-tension and sounded bright & zingy. Not as good as D’Addario and their electric short scale strings are (I think) only available in Nickel. Not a bad choice if nothing else is available – WAAYYYY better than Rotosound’s short scale strings. OK – I’ve never tried Pyramid strings, but it’s worth mentioning that guys like Paul McCartney used them which must say something!!! I’ve got a set on order as we speak so will report back when fitted and tried. That’s all I’ve tried so far. I do hope that this gives you some help in choosing your first set of short scale strings, or if you’re looking to change. Please feel free to email me at on scott@shortscalebass.co.uk if you have any questions. I’ve ordered a couple of sets of GHS strings since they made thier winding length longer. Both sets that turned up ended up too short for my SWB 1 so I presume they have sent me old stock. I’ve now resorted to asking the supplier what the winding length of thier short scale GHS strings is and whether they are old strings stock or not. They haven’t got a clue what I’m talking about and the usual answer is, ” we will enquire with GHS and get back to you”. The real shortscale one with original Gibson three studs bridge. It needs thick strings and enough tension otherwise it keeps on buzzing on the frets or you have to raise the action so high that its really no fun to play it at all. especially the e string needs the tension to sound well. Thanks Scott, very useful site for newcomers in the world of shorties as I am 🙂 I appreciate! I am a long time guitarist but a few days ago I had an opportunity to play 95′ korean Fenix SH, 30,5 scale. I was so bewitched by this guitar that I spent my last money on it. Looking for informations about short and medium scale basses I found this page and Your SWB model, which seems to be very interesting too. Have You ever experienced with detuning? I see You recommend GHS 44-106 for standard E tunning I guess. If I play in D standard how to recompense strings tensions? Which gauge could You recommand for playing with a pick? i am having a difficult time finding string for my supro pocket bass. short short scale. having problems with intonation with any string i try. I second that! Just purchased a new pocket bass from eastwood, but i prefer tape wounds. The scale on thier version is 26.5. Any suggestions? I also own a Supro bass Huntington II. Had the same problem with the E sting on that. The problem was that the nut was to high. I had that fixed and are very satisfied with the bass. Maybe you have the same problem? I have GHS Bassboomers on it. what would you recommend for SQ Jaguar Special? Im looking strings for a five-strings short scale bass of 30′, any idea? or recommendation? I would like the most bass sound possible. Hi Scott, I recently bought a passive bass and got some D’Addario EXL160S Short Scale Bass (50-105) – they are too short by about 2cm the taper comes to halfway to the first fret! Just discovered this site and your facebook page, well played, very good. Hi Scott! When you set up the SWB-1 basses, what strings do you put on? Brand, gauge, length, material… thanks! On mine which is due tomorrow, they should be GHS Super Steels, which are stainless steel. Gauge unknown at present. Based on the Medium Scale GHS Super Steels the gauges would be: .044 .063 .084 .106. Hopefully Scott can confirm this. I’m working with a local supplier to have stock of them very soon. Another string manufacturer to try could be Newtone as I hear they they can make specific lengths and gauges, British to! Like to hear how you feel about DR short scale strings. I been using them and have been happy. Also, I’m interested in buying your custom short scale. I tried contacting Brian about a year ago. Are they available to be built and ship to the USA? Also is shipping affordable? That’s a really useful review! I am trying to make my mind up about flat wound strings for a Tanglewood TW15 Baby Bass 26.75″ scale, came across these new Short Bass One strings made by Aquila and wondered if you had tried them? Hi Liz – I, too, have a TW15 and would like to try flat-wounds (see below). If you try any, please let me know how they sound. Thanks. Would you have any string recommendations for a Gibson SG short-scale (30″) bass? I find the E string to be particularly dead-sounding. Thanks. I don’t know why Scott picks and chooses but doesn’t answer all these questions, but that’s not important. I own 3 Gibson SG basses and have tried many different string configurations, so hopefully this will help you. I agree with Scott says here – especially regarding the SS Roto’s – but I do use their long-scale 88’s on my Fender P and love them. For the SG’s I’ve found the Labella Deep Talkin’ 760FHBB (Beatle Bass) to be the best choice if flatwound is your preference. They’re a bit longer than most SS strings, since the “Beatle” Hofner (and the many knockoffs) are usually a 32″ scale, but I’ve had no problems with the fit (although I’ve replaced the stock 3-point bridge with a Hipshot Supertone). The next best string IMO for the SG are the SS D’Addario Chromes in 45-100 or the medium-scale Nylon Tapewounds in 50-105, provided you don’t mind the black strings. Hope this is helpful and good luck. Very helpful information – thanks. I have a Tanglewood TW15CE BabyBass (acoustic). Can I use flat wound strings (it has an under saddle pickup)? I prefer the short scale, I play a mid scale 32″ at the moment. Do you have plans for a 5 string version at all? I do indeed have plans for a 5 string, in fact the plans will be going off to the factory to have the first sample built within a day or two. Keep your eye on the blog, or maybe ‘like’ the facebook page at https://www.facebook.com/shortscalebass/ to keep up to speed with it’s progress. You may try the “Höfner Contempary Bass Strings roundwound HCT1133R”. They come .040, .060, .075 and .095. I think they sound close to the Fender electric strings and they are really good. Mine last at least 2 years and the complete set is only about 13,– € in Germany. I use them on three short scale basses. A Hondo Alien from the mid ’80s (this is a headless “paddle” bass with aluminum neck – a copy of the Kramer Duke) superb sustain, but it doesn’t give you a really deep sound; a Jack & Danny bass, a model made as a sample for the Musikmesse Frankfurt which is not officially sold in Germany (yes, this is my main instrument), and a Career bass I bought used as a backup for only 30,– €, this one sounds good but is not as good to play as the others. Scott, I jumped on here based on seeing your link on another forum. I work for GHS, and would be happy to get you some of our “proper” short scale strings for you to review and comment on. Am I the only person here?! Anyroadup looking for a replacement fot the Rotosound disaster, which Labella set are the “growlers”, I’m a bit confused by the range……but I do like a growler! They used to be called ‘Hard Rockin’ Steels’ but are now just Stanless Steel Roundwound. Totally agree with your description of the Rotosound Shortscale Bass strings……Unfortunately I ordered a set the day before I found this site…….oh well, hey ho! The E string sounds a bit dead compared to the others, has strange indertones and was a disaster to intonate, pluck the string at the twelfth and its starts off about a quater tone sharp then settles down to pitch, which makes intonating fun!….This was the case with all the strings, however I like the tension of them, but they will have to go as I just can’t cope when at certain frets they sound out of tune, a real shame…..in the grand scheme of things they are cheap, but its still a waste of good beer tokens! Damn, sorry forgot to say…great, honest advice regarding string selection…..thank you! I have recently discovered your YouTube channel and am gradually working through the videos……all good so far! I like your style!…..
Any chace of a video discussing chords shapes especially in relation to Piccolo Bass? I cant find anything on the subject! I have (very) cheap Harley Benson Short scale P bass in the mail, which I intend to modify and string up as a piccolo……….should be fun! Crack on with the SW1 Bass! I’m tempted!